"Our finely crafted spacious festive hall is located in the prominent location just right to get your guests a pleasant environment. We have an efficient crew in place to assist the aggregated parties have a wonderful experience during your jubilation. 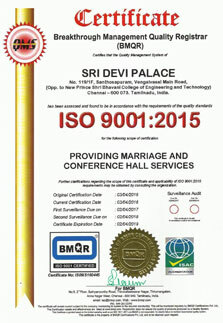 So, you pick the best marriage hall in Chennai. This grand palace near Tambaram offers an exclusive facility for celebrating weddings in style and luxury." 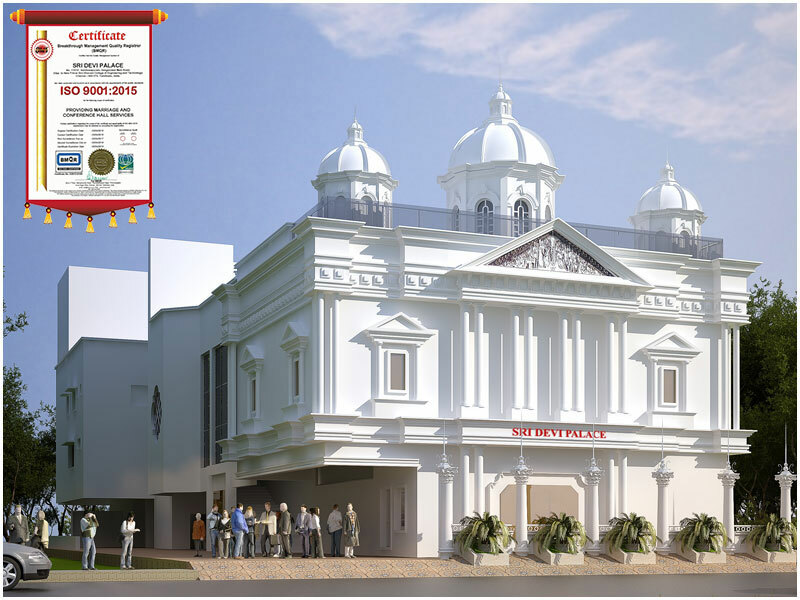 Fully Air Conditioned spacious hall it Can comfortably seat 1200 people. Individual rooms for the Bride and Groom, 8 rooms for guests to rest. The Kalyanam Mandapam near Tambaram is not so expensive. We offer very affordable cost for grand services. But we the Sridevi marriage halls near medavakkam know the need and demand of the present era. We offer the best standard of services, and suggest you to plan and organise your special day. AC marriage hall carries a big hall with a vast stage coverage. We Cordially solicit your esteemed presence on the occasion of Inaugrating "SRI DEVI PALACE" Thirumana Maligai on July 31, 2015, Friday-5.30 pm onwards @ Santhosapuram, Vengaivasal main Road, Ch - 126. Sri Devi Palace © 2018. All Rights Reserved.